Uniquely located property lined with beautiful Pecan Groves that only slightly tell the age and history of this land. Mature hardwoods, grape vines, cypress trees, and a natural creek allow this property to boast its natural beauty, right in the heart of the west side of Florence. 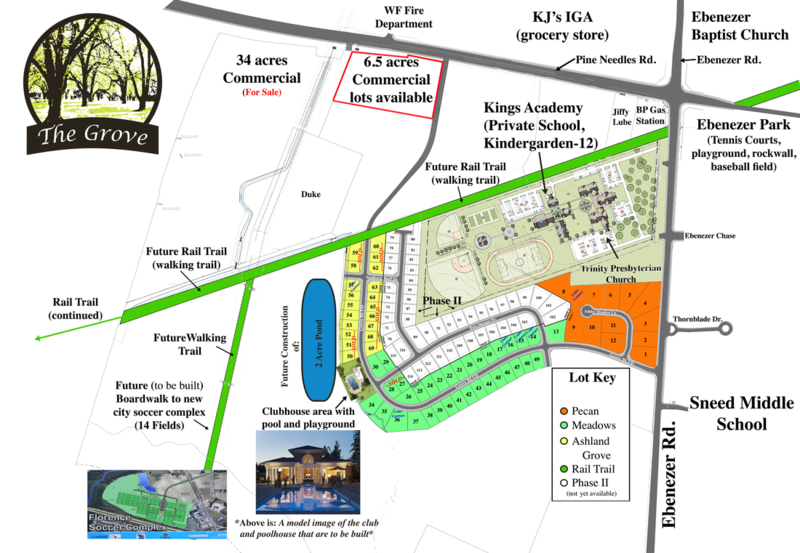 The Grove is within walking distance to a park, grocery store, gas station, two churches, and also two schools. Don't miss your opportunity to build and live in a neighborhood community full of vibrant wildlife and age old history. Demand for walkable neighborhoods is making the traditional suburban neighborhood obsolete. People of all ages are recognizing the health benefits of living in a place where they can walk to nearby shops, restaurants, recreation and social settings. The Grove connects your homestlye to your lifestyle like nowhere else in Florence. Trails and sidewalks connect your favorite recreational activity to your front door. The Rail Trail is a shaded walking trail located in the heart of the development connecting to Ebenezer Park and beyond. The park has tennis courts, a playground, ball fields, skate course, rock wall and covered outdoor cookout and picnic area. Another trail crosses the creek by boardwalk to access the new soccer complex. These 14 fields will be the newest in the state serving our residents and attracting regional tournaments. Our property borders Kings Academy, a private school from kindergarten thru 12th grade. Sneed Middle School is a public school located across the street from our entrance. Ebenezer Baptist and Trinity Presbyterian Church adjoin the property.